Happy is darling little beagle and one of Deb's favorites. He is hard to resist with his big eyes and long ears! Gunther is special in that he belonged to a Glenn and his kids when they were young. 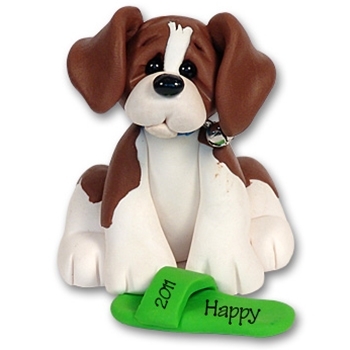 This puppy Christmas ornament may be easily personalized with a name on the bone. Handmade from polymer clay and designed by Debi Allison. He is packaged in his own little clear acrylic box with his dog house in the background.